A home in the woods needs more glass, which is why the owners of Interior Design Group, IDG in Lisle, Il selected Marvin Contemporary Studio series for their own home nestled on a wooded lot not far from Chicago. Skylights are an antidote to our long, dark cold Chicago winters when we tend to use more artificial light in our homes. Consider adding Velux skylights with high visible light transmittance (VT) for natural light while reducing the energy costs of keeping interior lights on throughout the day. VT doesn’t directly affect heating and cooling of your rooms, but it is a measure of how much light gets through the skylight into your home. A skylight with a high VT can be visually beneficial in winter for us humans, trapped inside our homes and starved for natural light. Woodland Windows & Doors has proudly featured Marvin products for years offering a full selection of their three brands, Marvin, Integrity and Infinity. The Infinity brand is a favorite replacement window among remodelers and homeowners alike. It’s designed to have the look and feel of traditional wood frames, but with modern features and low maintenance. There are certain facts of life that simply can’t be ignored and one of these is that Chicago area entry doors take a beating. The region’s warm, humid summers and its cold, bitter winters are a life fact that should be a top consideration when selecting an entry door for your home. Wood entry doors are an option for homes with well protected entries, but for the majority of homes in our area, Fiberglass doors are your best choice. Why Visit an Open House? We hope you’ll join us Saturday, September 30th at Woodland Windows and Doors at the corner of Lake and Gary for our Fall Open House. We invite you to learn about what’s new for windows and doors, gather with neighbors, family and friends, or enjoy some fun with your kids. Woodland sponsors the Open House because we’re completely dedicated to showcasing and educating the community about the beautiful and functional products available for your new home or your home improvement. We also like to hear directly from customer’s what products and services you need from us. What better way than to open the doors for people to leisurely explore, talk with experts and learn regardless of your immediate intentions to buy? Multi-Slide Door? Visit our Showroom to see the Marvin Oversized Door. There are somethings that you just have to see to appreciate their beauty, such as the Grand Canyon, the Tetons or a glacier lake. If you’re considering adding oversized patio doors to your home you really need to see our newly added four panel Marvin Ultimate Multi-Slide Door and experience its simple beauty. Drop in to our showroom to see first-hand the effortless glide of the door and the seamless transition from the interior to the exterior. Come see this 14’ wide by 10’ tall sliding door with a wood interior and gun metal clad exterior finish. 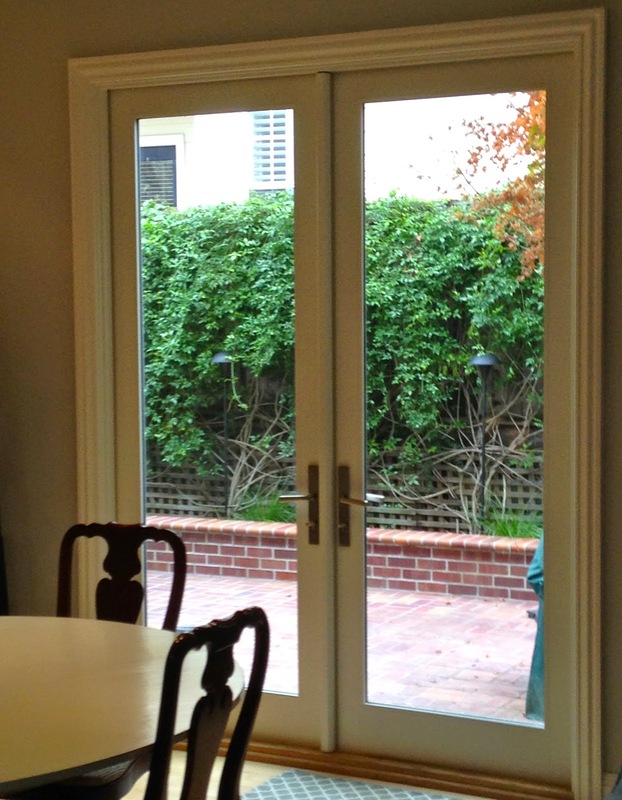 One of the most popular choices of exterior doors are French and sliding patio doors. Besides opening your home to expansive views, these choices let in light making them beautiful and desirable additions to your home. The major feature of French or sliding patio doors is the glass pane or panes, which can pose a security risk. Burglars may look through the glass to see if anyone is inside the home, they may try to break the glass, or push in a double French door configuration. If these beautiful glass doors would be perfect for your home, the good news is that there are multiple options with today’s quality modern glass doors that can reduce the risk of intrusion. You’ve settled into your dream home that you purchased last year when a huge storm blows through your area. Rain pounding against the house and streaks of water wash across your windows and doors. You scamper around your home ensuring yourself that all the windows and doors are securely closed when you notice a small water puddle on the floor next to the sliding patio door. You wipe it up and the next morning the floor is still dry and you conclude that it was just a hard pounding rain the likes of which no barrier could have kept some amount of water from penetrating. You’ve just spent months, if not years making the decision to replace your leaky inefficient windows. You’ve taken the leap and selected the best windows that your budget could manage. Now comes one more decision, which may be the biggest one you’ll make – who will install your new windows and what is their installation process? Remember this -no shortcuts allowed. Before signing a sales order for your replacement windows, select an installer and take the time to see at least one finished installations. Know the proper steps to install your type of window, for your particular home. Before you sign the installation contract read the detail. Gutter systems are an important part of any home. If your gutters are wearing out, the best time to replace is when you have a new roof put on your home. Most homes in the Chicago area have rain gutter systems. They are designed to control the flow of rainwater by channeling it away from the home. Gutters are meant to protect the home’s fascia, foundation, roof, and siding from water damage. Moreover, they control landscape erosion and prevent basement flooding. They are very essential for any home. Gutter systems come in two main shapes: the half round style and K-Style (an open rectangle). Half round gutters have a curdled top surface edge. Half round gutters are often fitted with a peg support across the top. There is also a threaded rod that curves to the roof’s angle and is attached in place beneath the shingles. K-Style gutters have flat surfaces and are usually fixed into the fascia board. A gutter system is one of the essential items on a home, yet it is typically neglected. If your home doesn’t have functioning gutters, you run the risk of having exterior wall damage, eroding foundations, or flooding basements. Also, if your home has gutters that weren't properly installed or lack proper maintenance, roof leaks can easily occur, causing major structural problems that can cost you a lot of money.